Fort Towson was established in 1824 to quell conflicts between lawless elements, American Indian peoples, and settlers claiming the area as part of Arkansas Territory. The fort also served as an outpost on the border between the United States and Texas, which at that time was part of Mexico. Connected to the East by road, Fort Towson served as a gateway for settlers bound for Texas during the 1830s. Those passing through the area included Sam Houston, Davy Crockett, and Stephen F. Austin. When the Choctaw and Chickasaw were displaced from their lands in the southeastern United States, the fort served as a point of dispersal upon their arrival in the West. The fort was also an important staging area for US forces during the Mexican War of 1846. Fort Towson was abandoned in 1856 when the frontier moved West. 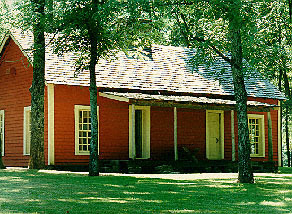 During the Civil War, however, it served for a time as headquarters for Confederate forces operating in Indian Territory. In 1865 General Stand Watie surrendered his command near the fort and became the last Confederate general to lay down arms. When the Oklahoma Historical Society acquired the site in 1960 little remained on the surface to portray its former importance. Visit The Encyclopedia of Oklahoma History and Culture to find out more about Fort Towson. May 11, 1 p.m.–3 p.m.